This is a 2003 Polaris Mx140 used jetski. This is a 3 passenger vehicle, that has a rebuilt engine. There was only 1 hour of riding time on it and that was to make sure it was running properly. If you are looking for speed then this is what you want. It goes up to 60mph. 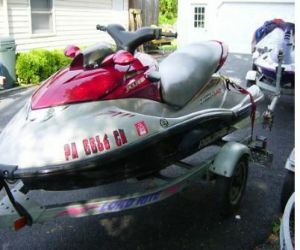 This jetski has been kept in pristine condition, if you look at the images this looks almost brand new. The seating has no damage what so ever, not even sun bleaching. There is a good deal of padding, so if you are going for a long haul you will be comfortable. All of the rubber grip that is on the floor is in great shape, so you will not slip upon entering or exiting this vessel. The side mirrors are all in tact and have no glass broken out or cracks. The body and paint are sparkling clean and free of blemishes. The rubber bumper that goes around the body is all there as well and is not broken off. This is red, silver and black in color. To the rear of the jetski you will see a hook that you can tow a wake skier or wake boarder on.